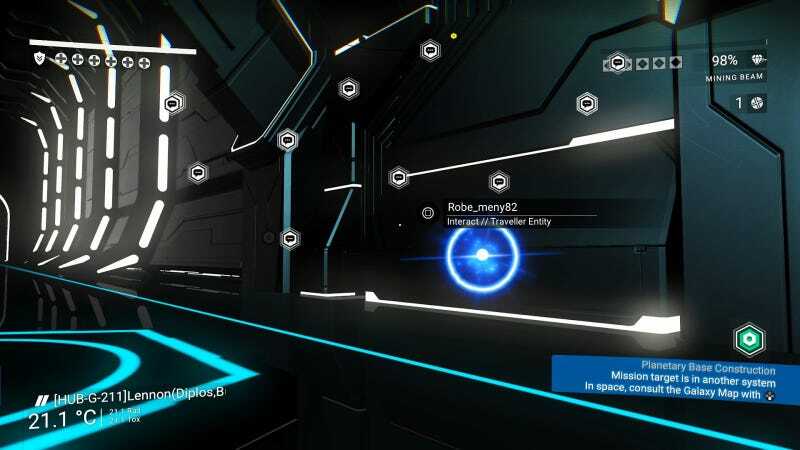 A year ago, No Man’s Sky players were disappointed to find out that they could not see each other even if they were in the same location at once. Now, after the latest update, players are finally meeting each other in-game. It’s kind of magical. According to DesignationG, he wasn’t able to see what this other player was doing to the environment, but on his stream you can hear them talk to each other. “It wasn’t even on my mind to check out the multiplayer features at first, but I was fairly confused when I saw the green player icon show up,” he said. “At first I thought it was a suit upgrade, but then I saw the username and it dawned on me.” This gave DesignationG a chance to roam around with this fellow traveler and test the limits of interaction (he said on Reddit the two of them could not see each other changing the terrain with the new terraforming tools). This limited multiplayer doesn’t have a lot of utility, but it’s still exciting to see the game take shape. Hopefully we can get a real party going on the Hub over the weekend.